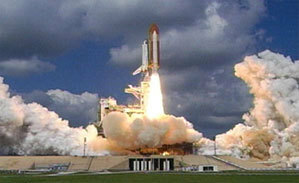 The NASA Space Shuttle Discovery launched this morning at 10:39 AM EDT. The shuttle's mission, STS-114, will deliver supplies to the International Space Station as well as perform maintenance on the station and test out new in-flight maintenance techniques for the shuttle. Congratulations, NASA, and we pray for a smooth and safe flight. More available at NASA's official STS-114 page. UPDATE: The most extensive array of cameras and sensors ever trained on a US spacecraft launch has detected what appear to be pieces of booster tank insulating foam and heat shield tile that were dislodged from Discovery during launch. It's difficult to say how serious this is, since all spacecraft launches have produced some amount of debris. But NASA scientists are on edge, because a large piece of booster tank insulation foam broke off during Columbia/STS-107's January 2003 launch, striking the wing and probably puncturing it, which caused the wing to break off and the shuttle to disintegrate upon atmospheric re-entry. If examinations of the Discovery by her crew result in the detection of possibly serious damage to the ship, the crew can abandon their ship, safely board the International Space Station, and await the (hopefully safe) launch of another shuttle to bring them home - provided that they have enough food, water, and oxygen to endure the wait. If that happened, it would reduce the operational shuttle fleet to only two craft - Atlantis and Endeavor - which would ultimately end the Shuttle program. A lot of people have opined that ending the Shuttle program would be a good thing. I'll have more thoughts on that subject tomorrow. A sobering video by producer Chris Valentine that juxtaposes the Challenger and Columbia shuttle disasters can be found here. A page of with more skillfully-produced videos exploring the Columbia shuttle disaster can be found at www.chrisvalentines.com. Valentine is an amateur astronomer and video producer who filmed the re-entry break-up of the Columbia, and subsequently created this website.